It is again my honor to welcome back author, friend (full disclosure) AND fellow Fangirl, Pippa Jay as a guest blogger to discuss how music inspired and rescued her newest story, When Dark Falls. When Dark Falls is the first story that had me shifting genres, and not being entirely happy about it at the time. I’ve considered myself a SF author for over thirty years, adding romance only after discovering that scifi romance actually is a genre in its own right. Since my debut novel in 2009, I’ve stuck to SFR and SF, and to a few sub-genres aligned with scifi like cyberpunk. So when I woke one morning with a line in my head more suited to paranormal/urban fantasy, I tried to shake it off. I hadn’t read much of either (other than several Anne Rice and Stephanie Meyer books, and a friend’s London-based UF). What the heck did I know about either of those genres?! But as usual, muse wouldn’t give up on the idea and Camp NaNoWriMo (August 2012) was fast approaching. It seemed a good opportunity to get the idea out of my system and get back to my home genre. And I had plans. Instead of sticking with the paranormal/urban fantasy feel the opening line had inspired, I was going to make it be SF. Oh, the line? “A deep gouge crossed her forearm, like something had clawed her.” See what I mean? A shifter or demon attack perhaps, or that’s how it sounded to me. Maybe I was reading too much into that one sentence, seeing as that was all I had. Something about it just said supernatural rather than outer space. But surely I could put a SF twist on that without much trouble? Instead of potential demons, I could have alien invaders. I even plotted the story – very roughly – but it was the first time I’d ever plotted anything at all. Camp NaNo began, and I dived into my paranormal turned scifi with my usual enthusiasm. And stalled at about 20K. By this time I’d veered so far away from my vague plot that the story wasn’t recognizable at all as the one I’d started with. Even worse, it had developed a split personality. The alien invasion plot line was there, but around it was something else I couldn’t even identify. Something not really scifi, not really paranormal. It appeared to be some kind of retro superhero story, nothing like I’d started with and yet coming from that same opening line. It was a mess, and what’s more it was a mess I couldn’t continue with or fix. I dropped out of NaNoWriMo. Something had gone very wrong. Superheroes are as unknown a subject to me as angels and shifters. Oh, I’d watched Spiderman cartoons as a kid, read the odd graphic novel, watched and loved the X-Men films (Spiderman and Batman, not so much). But it’s something else I don’t consider myself any kind of expert on, not well read about, and possibly not what most wouldn’t consider an actual fan (is there a certain level required to qualify?! I’ve never quite understood whether there’s a specified amount of knowledge or obsession required, lol). Could I write superheroes?! And then I picked up an album called Living Things by my new favourite band, Linkin Park. The music had quite a dark, oily, industrial sound to it, and as I listened to it while I worked on my story with its confused identity, the music helped reshape it. The music gave the feel and tone of the story. Some of the lyrics inspired the mixed up technology. A couple of the songs defined my conflicted heroine, and coloured her world and her companions, and especially her nemesis. It saved the story from being consigned to a file of unfixable stories (although the alien invasion version is lurking in there, somewhere). Without the music, I’m not sure When Dark Falls would have ever been completed. It’s not the first time that music has given me inspiration, and I sincerely doubt it’ll be the last. So have you ever had anything rescue a story or some other project from a dark and dismal end on your hard drive? Thanks Pippa so much for sharing this story with us! 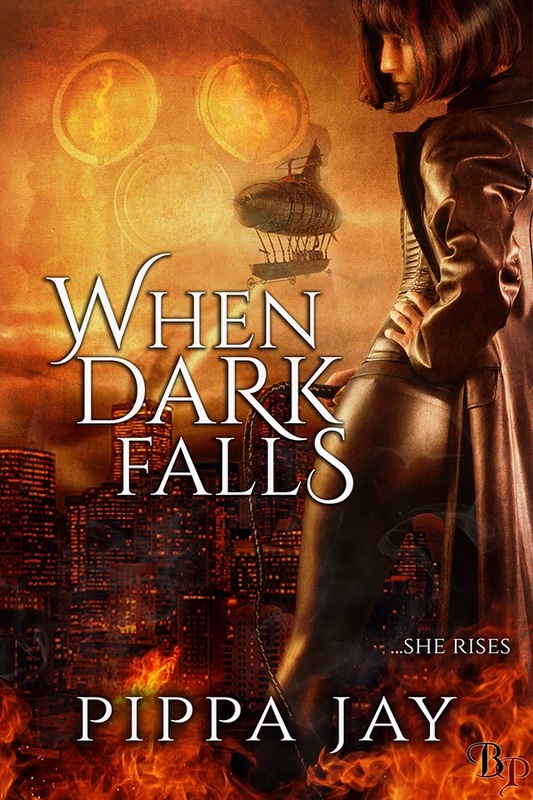 This post is part of the When Dark Falls blog tour contest, which open internationally until the 19th December, 2015. Pippa has donned her superhero guise for the length of the tour, and you get to name her character and talent(s)! If Pippa likes it, then she may include it in the sequel to When Dark Falls and credit you in the acknowledgements. To enter, please put the name, talent, and your contact details in the comments below. Please note – by entering this contest you are giving Pippa full permission for her to use the superhero name without any recompense to you, financially or otherwise, other than the acknowledgement, and you are waiving any rights to the name. You’ll also get a digital format of your choice for When Dark Falls. When Dark Falls is an alternative 1920s superhero romance released by Breathless Press. You can also add When Dark Falls to your Goodreads shelf HERE. Sign up to her no-spam newsletter HERE to stay up to date with releases, cover reveals, sales and giveaways for all her titles and more. The roar of the cloudburner flaming into life woke her. The vibration as it powered up rippled through the building created a disturbance impossible to sleep through. No more being roused from sleep by the dawn chorus of traffic or a rowdy neighbor. Those days were long past. Everyone in Nephopolis woke to the sound of fire burning into the clouds, to cast a false darkness over the city. The shadow of Dark. Kadie stretched…and froze. She stared at her left arm. A pattern of blue and purple covered her forearm, a harsh contrast to her otherwise pale skin. She shuddered, turning her arm this way and that. Had she fallen out of bed? And if so, why hadn’t she woken? She didn’t remember catching it on anything yesterday that would have gone unnoticed and yet left such intense bruising. One day blurred into another now, but even so, surely she’d remember hurting herself that badly? The idea made her stomach churn too much to consider it. Instead, she swung her legs out from under the duvet. Pale pink flannel pajamas clothed her, crumpled from a night’s sleep but nothing more. Her bare feet revealed no signs of midnight wandering. What the hell had happened to her arm when everything else seemed so normal? 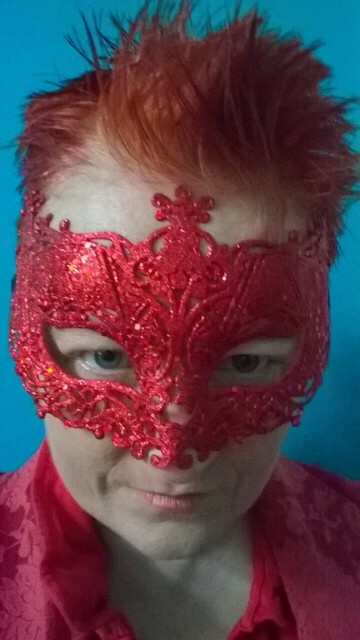 Superhero name: The Red Queen. Thank you Pippa! I am so happy to give you a forum for your stories!